Imagine driving cross-country and hearing the same song playing repeatedly on the radio, ad nauseam. This is an apt depiction of Goldenboy’s sophomore effort Underneath the Radio. Admittedly, with a name like Goldenboy, expectations are relatively high. Unfortunately, within the first 10 minutes of the endeavor, the disappointment becomes inescapable. The letdown isn’t just in the name either; it stems from the music itself. 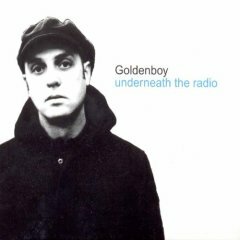 It seems as if Goldenboy was trying to turn the entirety of Underneath the Radio into one or two long, drawn out songs. The dull drums on most, if not all, of the tracks would be enough to lull anyone to sleep. Nevertheless, the problems all boil down to one simple, plain fact: There isn’t enough contradiction between the voice of lead singer Shon Sullivan and the drearily ho-hum guitar accompaniments that are featured on most of the album’s cuts. At one point during Summer of the Evening, for example, Sullivan calls for a guitar solo. The jangly sound of an electric guitar briefly graces the listener’s ears and then retracts. This too-shy moment is just one of the many less than stellar performances found on the disc. Usually, if the music is horrid, there is some kind of lyrical redemption. Here, too, Goldenboy falters. Sullivan’s lyrics are weak, at best, and his elementary rhyming schemes are so poorly conceived that they serve as a distraction from whatever musical credit the band otherwise might have salvaged. Lines like "the afternoon is soft and gray/it’s been so long since I’ve felt this way" are like the final nail in the coffin to anyone still holding on for anything substantial from this band. Now, with the count at no balls and two strikes, the listener can only hope that at least the lead singer will have a strong voice. Once again, Goldenboy fails to land a hit. Sullivan wants to revel in a soft, soothing whisper, but this does not work. He coos the broken storylines in a fashion that is so cowardly and weak that, when all is said and done, the urge to punch him in the face becomes irresistible. After Underneath the Radio ends, the ringing of Goldenboy’s horrid attempts at originality still can be heard. In fact, it’s nearly impossible to tell when the disc is over, because it all sounds the same. Goldenboy has two choices: hibernate a bit and do something original, or give up. Here’s to hoping that it’s the latter. Underneath the Radio is available from Barnes & Noble.